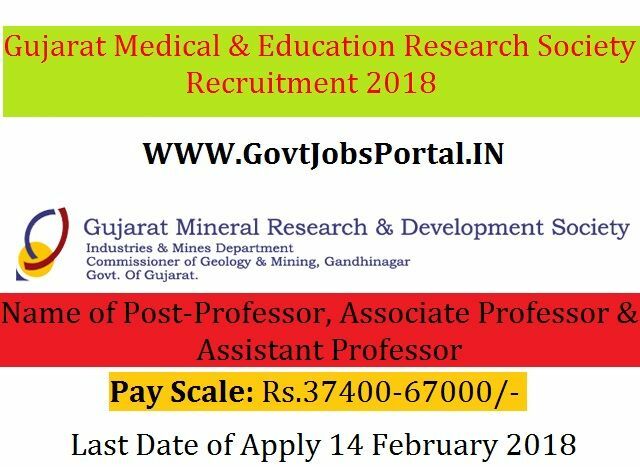 Gujarat Medical & Education Research Society is going to recruit fresher candidates in India for Professor, Associate Professor & Assistant Professor Posts. So, those candidates who are willing to work with this organization they May apply for this post. Last Date of Apply 14-February-2018. Total numbers of vacancies are 349 Posts. Only those candidates are eligible who have passed FINAL MBBS / BDS/ P.G Mark Sheet and MS/MD/MDS/D.M./M.Ch/GMC/GDC Registration Certificate. Indian citizen having age in between 22 to 50 years can apply for this Gujarat Medical & Education Research Society Recruitment 2018. Those who are interested in these Gujarat Medical & Education Research Society jobs in India and meet with the whole eligibility criteria related to these Gujarat Medical & Education Research Society job below in the same post. Read the whole article carefully before applying. Educational Criteria: Only those candidates are eligible who have passed FINAL MBBS / BDS/ P.G Mark Sheet and MS/MD/MDS/D.M./M.Ch/GMC/GDC Registration Certificate. Age Criteria: Candidates age limit should to be possess minimum age 22 years & maximum age 50 years. What is the GMERS Selection Process job?